patterns of behavior, and depressive state. put in the high-dependence category. from 0 to 63. Higher scores indicate greater depression. greater, depression (cutoff point 13/14) . high-depend ence category (cutoff point 33/34). Table 1. Scores for each questionnaire. Table 3. 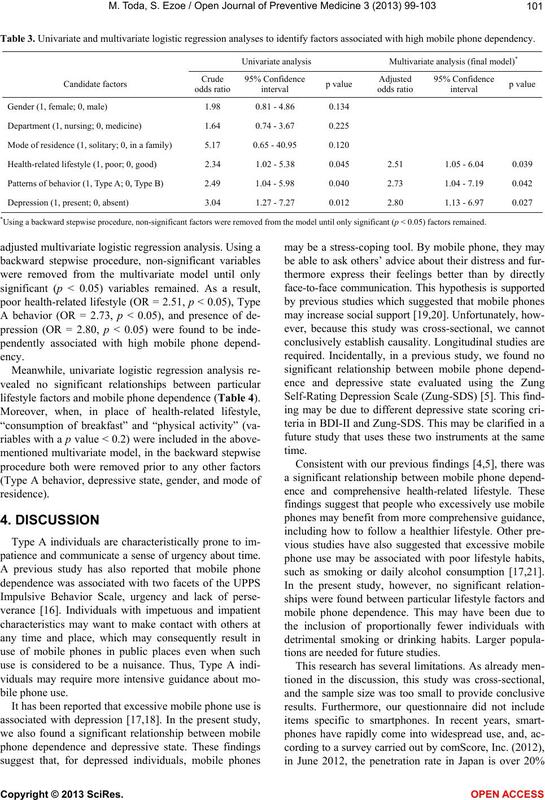 Univariate and multivariate logistic regression analyses to identify factors associated with high mobile phone dependency. *Using a backward st epwise procedure, non-significant factors were rem oved from the model until only significant (p < 0.05) fac tors remained. 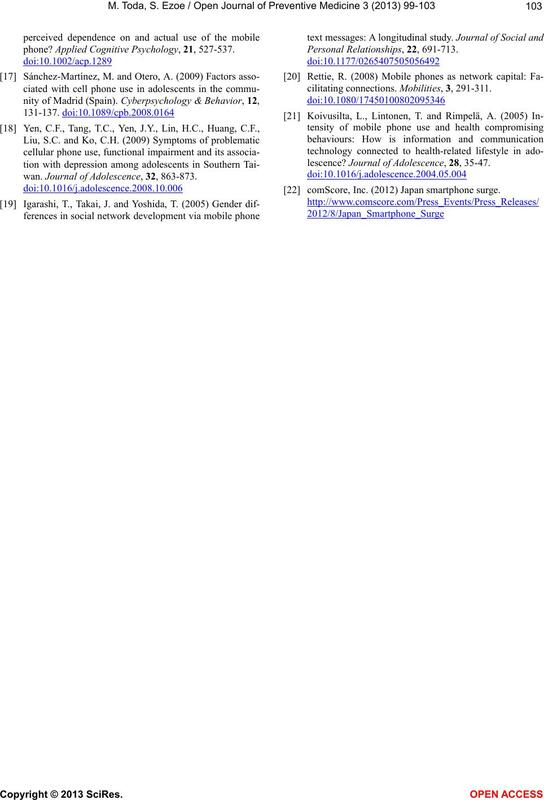 lifestyle factors and mobile phone dependence ( Tab le 4). patience and communicate a sense of urgency about time. such as smoking or daily alcohol consumption [17,21]. tions are needed fo r future studies. factors associated with high mobile phone dependency. *Odds ratio not calculable b ecause of zer o v alue. recent developments, we are planning further studies. students. Japanese Journal of Hygiene, 59, 383-386. Ezoe, S., Toda, M., Yoshimura, K., Naritomi, A., Den, R.
male students and perceived parental rearing attitudes. 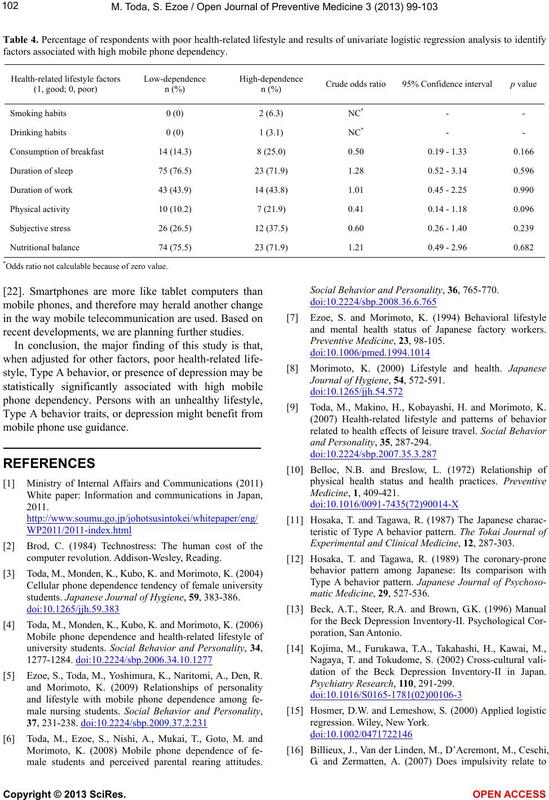 Social Behavior and Personality, 36, 765-770.
and mental health status of Japanese factory workers. Journal of Hygiene, 54, 572-591. 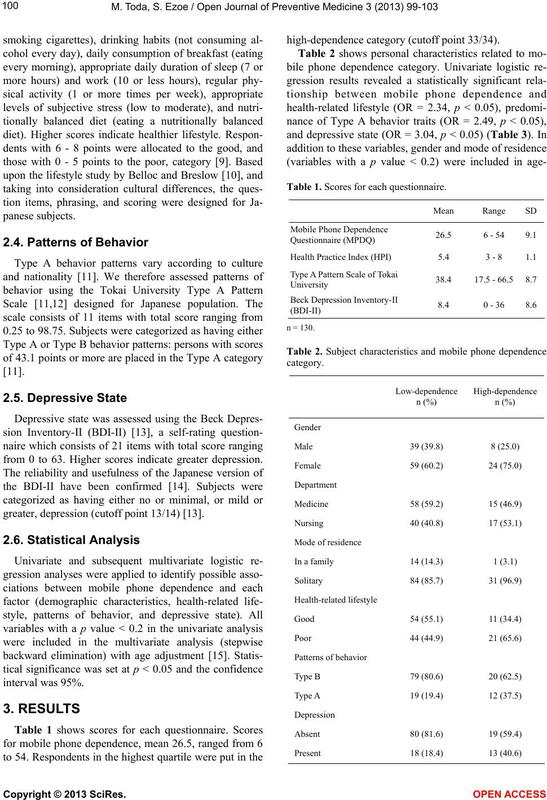 Toda, M., Makino, H., Kobayashi, H. and Morimoto, K.
Experimental and Clinical Medicine, 12, 287-303.
dation of the Beck Depression Inventory-II in Japan. phone? Applied Cognitive Psychology, 21, 527-537.
wan. Journal of Adolescence, 32, 863-873.
cilitating connections. Mobilities, 3, 291-311.
lescence? 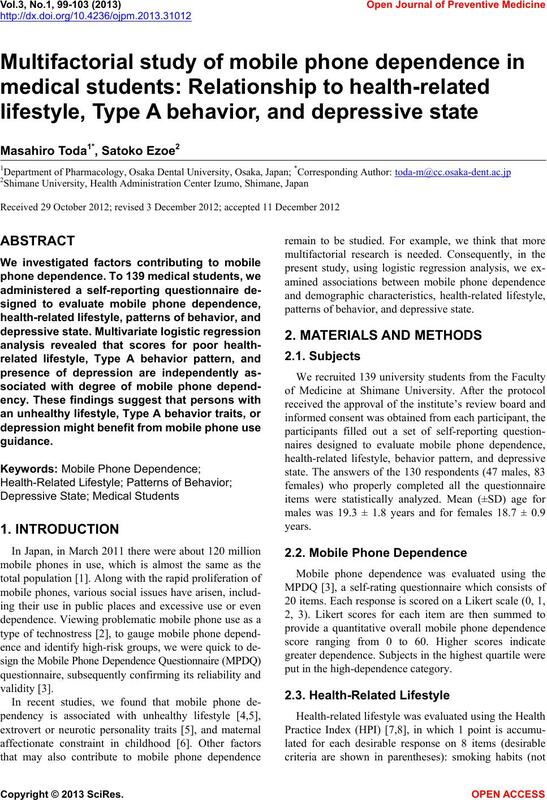 Journal of Adolescence, 28, 35-47.
 comScore, Inc. (2012) Japan smartphone surge.